No, not with me. I know, bummer. 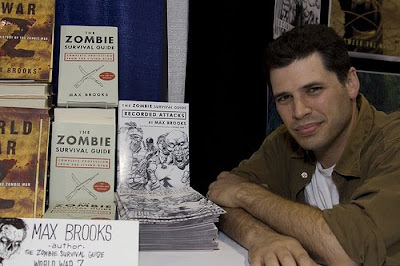 However, TimesUnion.com has posted an interview with zombie guru, Max Brooks. Head over and check it out. He talks about his dinner with George Romero, his use of props during appearances, and his advice regarding not being too proactive exterminating zombies. Q: What I admire most about your oeuvre is the seriousness with which you take zombie threats. How do you feel about films such as "Sean of the Dead" or "Zombieland" that use zombies for laughs? And how about vampires (as in "Twilight" or "True Blood") who try not to act like vampires? A: I have nothing against zombie comedies. They help spread the word and keep the general morale high. As far as vampires go, well, we know vampires don't really exist, right?